When the Democratic National Convention opened on April 23, 1860 in Charleston, South Carolina, the delegates’ objectives were to set the platform and select candidates for the 1860 election. Illinois Senator Stephen Douglas was one of the politicians who hoped to receive the nomination. While some Democratic newspaper editors considered him as the best hope for victory in November 1860, others argued that he exemplified the sectional divisions within the party. Douglas, as the New York Herald explained, was not “a moderate man who can unite the whole party.” The divide within the Democratic party became clear when the convention ended on May 1 without delegates selecting any candidates. Instead, Democrats would reconvene in Baltimore, Maryland on June 18. 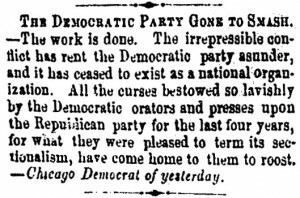 Republican newspapers like the Chicago (IL) Press and Tribune were quick to use the Charleston convention to characterize the Democrats as “an intensely sectional organization.” Abraham Lincoln, as the Press and Tribune noted, had predicted such a development during his debate with Senator Douglas at Galesburg, Illinois on October 7, 1858: “I see the day rapidly approaching when [Douglas’] pill of sectionalism, which he has been thrusting down the throats of Republicans for years past, will be [crowded?] down his own throat.” While Northern Democrats eventually selected Douglas as their candidate, Southern Democrats nominated John C. Breckinridge.